Quantum Computing is considered as an increasing threat to Blockchain Technology. However, it can be also the game changer in securing the latter. Quantum Computing is based on quantum mechanics. Leveraging the technology to develop smart contract and blockchain applications is the strongest way to tackle its increasing threat. Quantum Computers are different from conventional digital computers, which are based on binary digits. While digital computers process in terms of two defined states of 0 and 1, quantum computers works on a quantum bit. Quantum Bits are understood as Superposition of states, also known as Qubits. Quantum Computing Believed as a Threat to Blockchain? Quantum Computers have much higher computational powers compared to conventional ones. This makes them perfect to solve large and complex cryptographic problems. It finds cryptographic keys using Shor’s Algorithm, deciphering the complex factors. This prowess is the reason for a strong conviction that Quantum Computing is emerging as a threat to blockchain technology, for the latter is entirely based on cryptography. However, contrastingly, this technology can also develop the most secured blockchain and to develop Smart Contract. Several enterprises have already started developing blockchain application using quantum technology. The objective is to develop an encryption, secured enough, such that even the strongest quantum computer cannot breach it. Blockchain uses Public Key Cryptography to secure the identities of senders in transactions and render security to records in its ledgers. Hashing is the most common technique in blockchain to secure information of transaction records. In this method, large digital information is combined with cryptographic functions to mask the information. Hash functions also combine the encrypted information with digital signatures to ensure data integrity. The only way to secure hash functions from quantum computers is to develop them using the same technology. Read More: How Quantum Computing will Secure Blockchain. Read More: The New Amazon Quantum Ledgers. If quantum computing is a threat to blockchain, the same technology can be used to develop quantum blockchains. Quantum Computing can generate stronger Hash Functions, which require massive computational power to work on. Thus, stronger is the encryption by quantum computing, it would need stronger quantum computers to decrypt. Using such quantum-enabled encryption, Smart Contracts can be made unhackable even with other strong quantum computers. Apart from this massive security, quantum computing offers another advantage. Quantum Computing has the property of entanglement in time and space. It means any bits or information in a quantum space will automatically entangle in time and space. Without the proper cryptographic key, it is would be almost impossible to track down the information in a previous block. The information would not even exist in the form they were fetched in the ledger. Only the hash function that decrypts it can encrypt it. Thus, a quantum Smart Contract is completely tamper-proof. Such technology will ensure that episode like the DAO Hard Fork never arrives again. 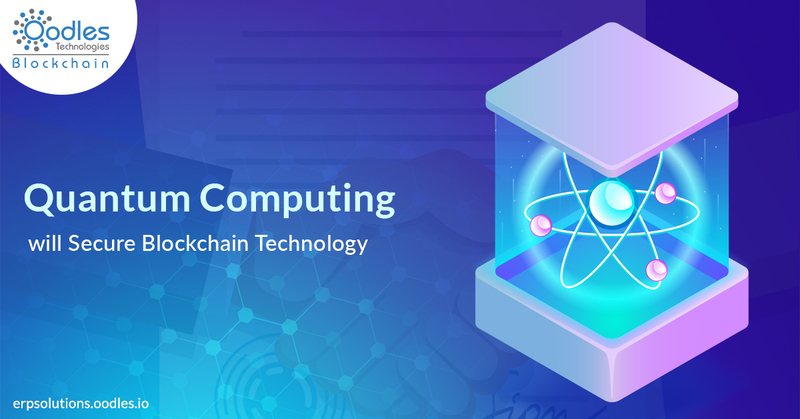 Although Quantum Blockchain and Smart Contract are not yet developed, several enterprises are already using quantum computing to secure blockchain applications. This trait will gradually evolve towards developing quantum blockchain. Blockchain could possibly replace the internet someday, and in far future, the technology itself could turn into a quantum-based mechanism. There is a strong possibility of a quantum web, which is extremely secured compared to that of today’s internet, while quantum computers replace conventional devices. The idea seems utopian, but was not internet utopian centuries before?